In one week, on Friday, November 2nd, join us for two very special events. 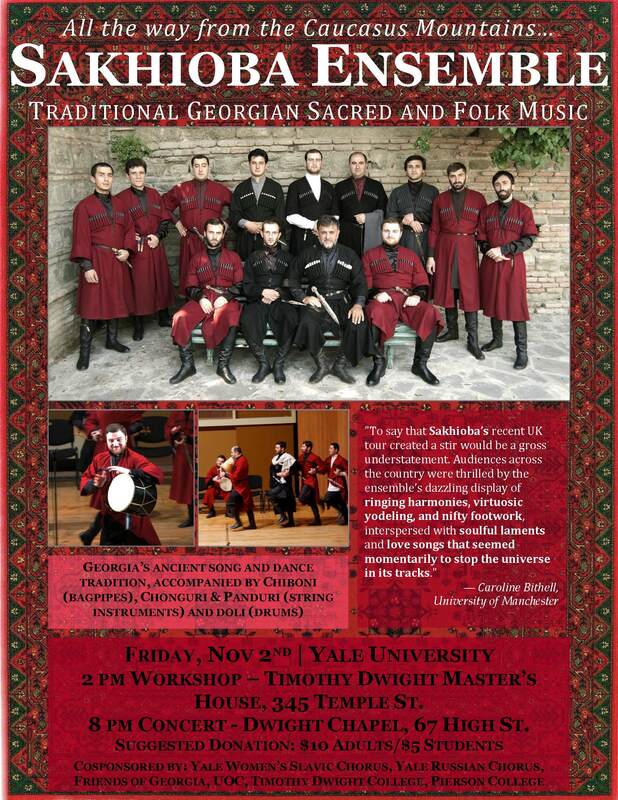 Sakhioba Ensemble, a Georgian men’s choir specializing in traditional sacred and folk music, is touring the U.S. and stopping by Yale on their journey. Check out the information below for the details of their Yale stop, and follow this link to see the schedule for their full U.S. tour! At 2:00 pm, join us for a free public workshop in the Timothy Dwight College Master’s House (345 Temple Street) with Sakhioba and The Yale Russian Chorus. At 8:00 pm, come to Dwight Chapel (67 High Street) for a concert like you’ve never heard. The Slavic Chorus will sing a short opening set. Tickets can be procured at the door, with a suggested donation of $5 for students and children and $10 for adults. We hope to see you there!